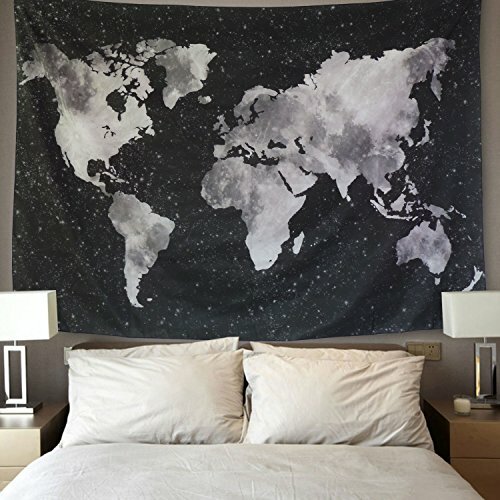 BLEUM CADE Starry World Map Tapestry Black & White Abstract Painting Wall Hanging Home Decor for Living Room Bedroom Dorm Room 59"x82"
Looking for a special piece of home decor to change your room from ordinary to extraordinary? BLEUM CADE modern stylish pattern tapestry is an essential elements to decorate your home. ✓ This gorgeous piece of art can be used as bedspread, bed cover, table cloth, curtain and of course as a tapestry or a wall hanging. ✓ Particularly for teenagers, decorate their rooms! CLICK THE YELLOW 'ADD TO CART' BUTTON ABOVE NOW TO DECORATE YOUR HOME BY USING BLEUM CADE World Map Wall Hanging Tapestry! MATERIAL: your new wall hanging tapestry is made of Polyester, smooth, super soft and skin-friendly, durable and fast drying. PRECISE BLACK&WHITE DESIGN: advanced technology is applied to print the starry world map tapestry patterns. Popular starry black and white world map style, vivid colors will satisfy you. MULTI-FUNCTION: Features stylish designs and well made craftsmanship, these high quality hanging tapestries are versatile and they are time proof for both indoor (wall hanging, home decoration, tablecloth and window curtain) and outdoor use(beach cover up, beach tapestry and etc). 100% MONEY-BACK GUARANTEE: If you don't like BLEUM CADE wall hanging tapestry for any reason, you can just take advantage of our ONE-YEAR guarantee! We will replace it or give you your money back for any reason! NO QUESTIONS ASKED! If you have any questions about this product by BLEUM CADE, contact us by completing and submitting the form below. If you are looking for a specif part number, please include it with your message.